The following is a report written by Lazair enthusiast, Brian Steele, and recorded on the forums of www.rcgroups.com – He details his experience seeing the eLazair in flight at the Gleen Curtiss Annual Seaplane Homecoming in the fall of 2011. 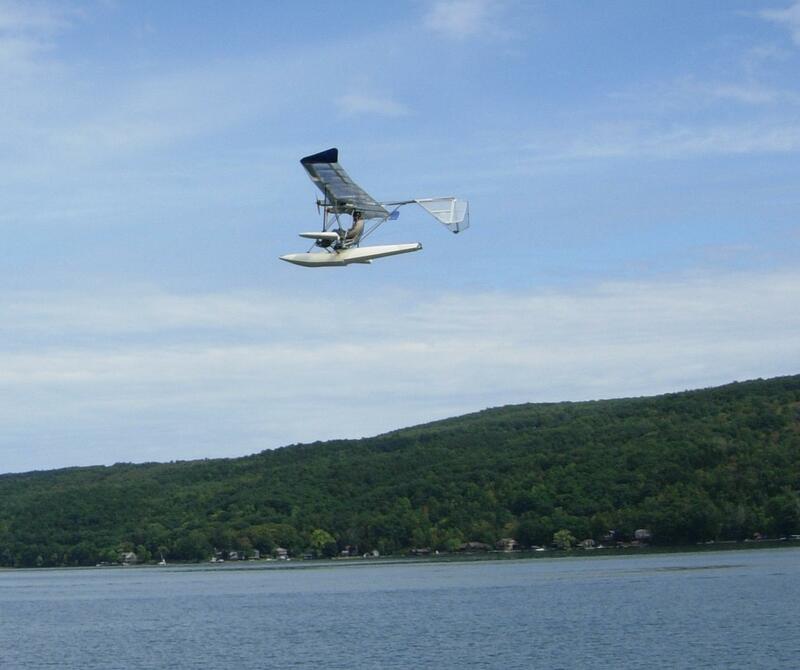 “For the past few Septembers, I have attended the Glenn Curtiss Annual Seaplane Homecoming. This event takes place at Hammondsport which is located at the southern tip of Beautiful Lake Keuka. This is a very low key event which pays homage to arguably the most innovative Aviation Pioneer. If you are within driving distance I would recommend attending this event -capped off by a tour of the Curtiss Museum. Often, a Vintage Curtiss aircraft is flown as an event attraction. Last year a 1912 Navy Seaplane was flown. But this year was very special to me. I learned that Dale Kramer was going to fly his Electric Powered Lazair. I have never seen a 100% scale electric fly (in person) and it is poignant that this flight would take place at exact location that the Curtiss achieved the World’s first successful Seaplane flight, over 100 years ago. I was doubly interested since I was an “acquaintance” of Dale’s –before his Lazair days. I actually knew Dale’s Dad better, since he graciously invited us to use his shop to create some parts for our Homebuilt Aircraft. We would see Dale working on one of many designs he built and tested before the birth of the Lazair. Dale was still in his “teens” and I think I saw him working on a Plank (no sweepback) type of “Flying Wing” that he intended to fly to Oshkosh. In any case (IMHO) the Lazair was “light years” ahead of that era of “Ultralights” which were mostly single surfaced sailcloth winged designs that were braced by a zillion wires. The Lazair was very successful and received many accolades and awards. I truly believe that the design is still one of the most efficient and innovative aircraft when compared to current “103” designs. For one reason or another, I totally lost track of Dale and his whereabouts for over 30 years. To say that the Lazair flew very well would be an understatement. Dale flew several “close-in” passes at a very low throttle setting (3100 rpm-I think). At this power setting…the Lazair was “on step” i.e. Not flying in an elevated alpha ( AOA) or struggling to fly at that power setting. It was sufficiently in the “groove” that Dale made several fairly tight -low altitude -180 degree turns in order to stay in front of the crowd. He would not do this-if the aircraft was even close to a tip stall. The flight was culminated by a gentle landing…very near the ramp. The Lazar definitely stole the show. A large crowd gathered and had endless questions-which Dale fielded with class and patience. We are fortunate that Dale has shared his development with us. He is modest when talking of his experience and abilities. I knew that Dale was a great designer and a craftsman…but I had no clue he had such a depth of not only motors but in electronic design. If you closely look at the photos he has posted-you will see superb CNC machining (throttle quadrants) and very professional custom PC boards that I believe he created using “layout software… Innovation and craftsmanship are evident in each detail. There are many parallels relating to Curtiss and Kramer (If you read a Bio of Curtiss). So I don’t think is too much a flight of fantasy for me to say that Dale’s demonstration at Hammondsport evoked the Spirit of Glenn Curtiss.